KUWAIT CITY, Kuwait, October, 2016 – Ford customers in Kuwait can now visit Alghanim Auto’s certified Ford showroom and service center in the Shuwaikh Industrial Area,, for the purchase and services of any Ford vehicle, safe in the knowledge that the aftersales team are fully qualified and Ford-certified. Since becoming the only authorized importer by Ford Motor Company for Ford vehicles as well as original Ford and MotorCraft® parts in Kuwait, Alghanim Auto has not spared any time in ensuring the right team members are trained and certified by Ford Motor Company in order to deliver a world-class customer sales and service experience to its customers. 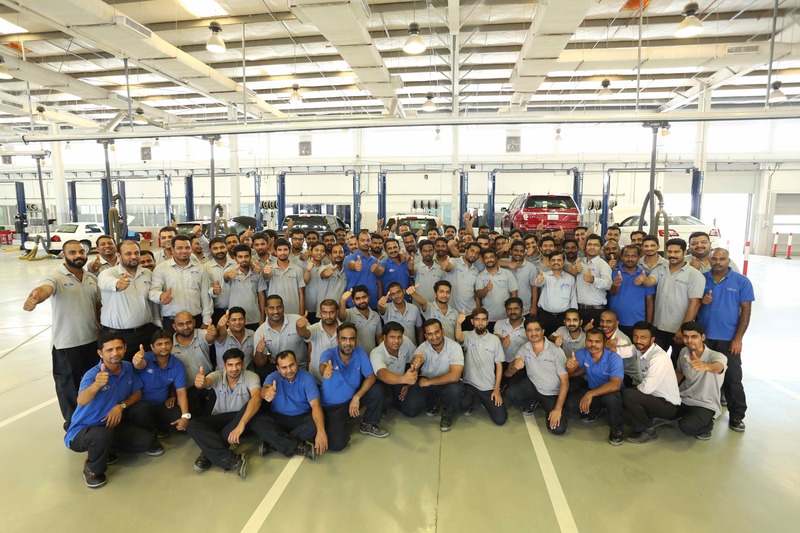 Over a very short space of time, close to 100 Alghanim Auto Aftersales team members spent 3,722 man-hours covering 87 different training modules before becoming fully Ford-certified. The training, which consisted of classroom, web-based, and shop-floor instruction, ensures that 100 per cent of customer-facing staff are 100 per cent qualified to assist and uphold Ford’s high standards. Those trained include service advisors, parts counter salespeople, warranty administrators, and technicians catering to electrical components, climate control systems, diesel engines diagnostics and repairs, and other categories. “Kuwait is a very important market for us, and together with our partners Alghanim Auto, we are committed to grow the business and deliver excellent products and customer experiences in Kuwait,” said Bilal Jabak, regional After-Sales manager, Ford Middle East, who recently visited the market to recognise the Alghanim Auto team for their certification. Ford Middle East reminds Ford and Lincoln customers that they can get immediate access to original Ford and MotorCraft® parts as well as warranty and Extended Service Plan (ESP) contracts, in addition to maintenance and body shop repair services by Ford trained and certified technicians at the dedicated Alghanim Auto Ford service centre in the Shuwaikh Industrial Area, opposite the Classical Car Museum and Sirbb Circuit. The main service center working hours are 7AM to 7PM from Saturday through Thursday. For added convenience, the Express Service working hours are 7AM to 10PM Saturday through Thursday, and 2PM to 7PM on Friday. For more information, customers can call the Alghanim Auto customer care center at 1898900; visit www.fordalghanim.com or directly on social media channels at the handle @FordAlghanim.